The interplay of climate change, environmental degradation and migration and the challenges it presents cannot be addressed effectively at the policy, research or operational levels without regional, international, and global collaboration and coordination that would reach not only across countries, but also across disciplines. Such cooperation needs to incorporate, inter alia, climate science, geography, migration, development studies, health, security and human rights. There is also a need to involve different types of actors in the cooperation and to bring together government, international organizations, civil society, private sector and academia. IOM is committed to close cooperation with all relevant stakeholders to develop more comprehensive strategies to better manage environmental migration and to address potential impacts of migration on the environment. 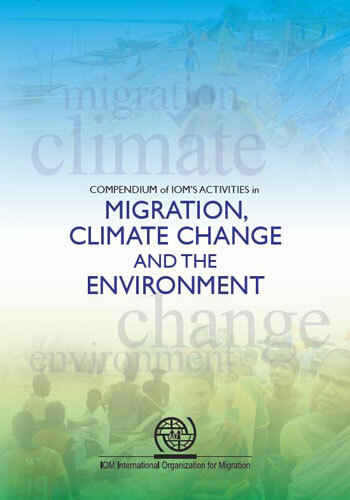 In order to create an appropriate informal framework for the necessary multi-stakeholder and multidisciplinary cooperation in the area of migration and the environment, IOM, together with UNEP, UNU and the Munich RE Foundation have established the Climate Change, Environment, and Migration Alliance (CCEMA). Today, in addition to these four founding members, the Alliance membership also includes the United Nations Office for the Coordination of Humanitarian Affairs (OCHA), the Stockholm Environment Institute (SEI), the University of Sussex and the World Wildlife Fund (WWF) International. The Alliance is based on the existing collaboration among the above-mentioned agencies and is conceived as a multi-stakeholder global partnership of concerned actors such as international organizations, interested groups of states and representatives of the private sector, the scientific and professional community and civil society. These actors represent a range of perspectives including environment, migration development and humanitarian assistance. The Alliance aims to bring migration considerations to the environment, development, and climate change agendas and vice versa. This objective will be pursued through a combination of awareness raising, research, policy development and practical actions. IOM is also providing administrative and organizational support for the CCEMA work programme development. There has been growing cooperation on climate change, environment and human mobility among the humanitarian agencies, most notably within the framework of the Interagency Standing Committee (IASC). IOM, together with IFRC, UNHCR and the RSG on Human Rights of IDPs, has taken an active role within the IASC process in incorporating climate change on the humanitarian agenda. In particular, following a request from the IASC Working Group, IOM in coordination with the IASC Secretariat and in cooperation with other agencies, has carried out a series of informal interagency meetings and consultations to develop appropriate terminology and typology on migration and displacement and climate change, and to identify possible operational and analytical gaps in the context of the humanitarian response. The outcomes of these activities are included in the IASC informal Group working paper on “Climate Change, Migration and Displacement: Who will be affected?”. These results fed into the institutional work of the IASC and were also submitted to the United Nations Framework Convention on Climate Change (UNFCCC) ahead of the 14th Conference of the Parties (COP), held in Poznan, Poland on 1-14 December 2008. Furthermore, IOM in cooperation with other IASC agencies concerned with the issue of human mobility (UNHCR, the RSG on the Human Rights of IDPs, the Norwegian Refugee Cross and the United Nations University) participated in a number of side-events held in the margins of the UNFCCC climate-change talks – in Poznan on December 8th 2008 and in Bonn on April 6th and June 8th 2009. In a further attempt to have the humanitarian voice included in the UNFCCC process, Heads of the 18 IASC agencies, including IOM, signed a joined letter addressed to the Executive Secretary of the UNFCCC and to the climate negotiators. The overall purpose of this letter is to highlight the humanitarian implications of climate change and to call for these implications to be acknowledged in the post-2012 UNFCCC agreement.